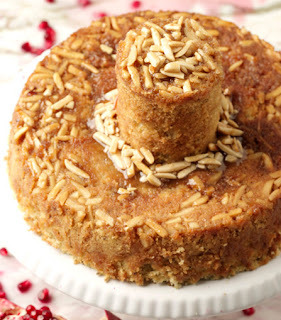 Best served at a big family breakfast, this coffee cake rings in the first morning of the new year in Greece. You can easily recognize the cake by its tiered shape, with a small round cake set on top of a large round cake. The tradition is to serve the cake to the youngest first, then the next-to-youngest, and so on, and the person who finds the hidden coin or trinkets will have good luck for the year. In some areas, while the cake is cut a pomegranate is thrown to the ground to scatter the seeds for a fruitful year.